In close strategic and technical co-operation with the Japanese Taica – Group the Data Display Group developed their own optical bonding production process: VacuBond®. Vacuum bonding (also direct dry optical bonding) allows for a zero optical defect production and provides perfect material stability (no yellowing). Also modern sleek TFT displays can be bonded with this fully automated production process without any problems. In contrast to the competitor-used polyacrylate / acrylic material with an operating temperature range of only -30 to +80°C and medium-term yellowing, we solely process the Taica high-performance silicone, which was developed especially for optical bonding. It features an operating temperature range of -40 to + 120°C and shows no yellowing. Please click here for further advantages of VacuBond® and an extensive overview of successfully passed certifications. laminating all kind of glasses (also PMMA and Acryl) and touchscreens of all technologies up to 32″. In contrast to autoclave laminating (often > 100°C) the VacuAssembly process takes place at room temperature and avoids laminating beyond the specified temperature range of the components. 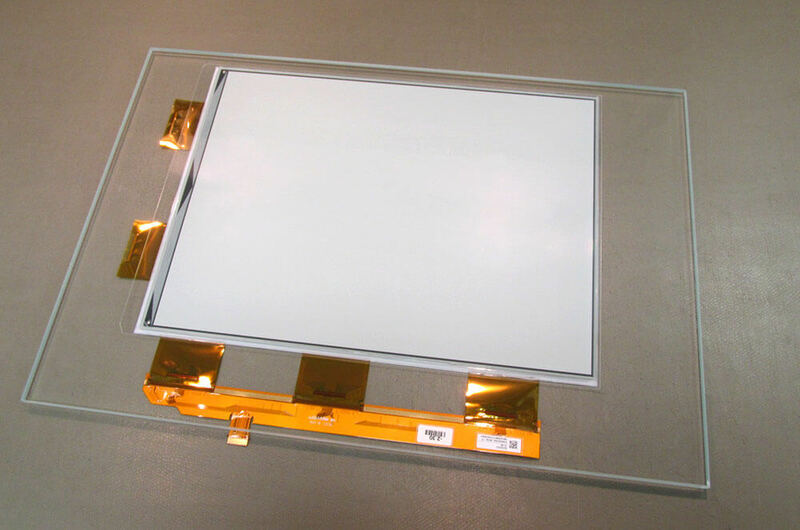 The strength of VacuBond® dry optical bonding becomes evident when bonding electronic paper, which, in contrast to a TFT displays, has no mechanically stable structure, and no bezel. 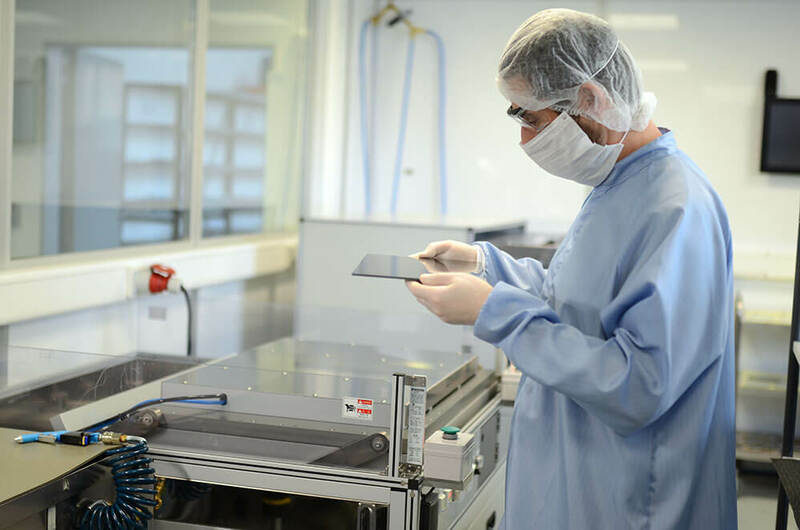 The high-tech silicone OPTαGEL® securely connects the e-paper with a protective glass, or foils to a unit. The smooth surface of the e-paper is susceptible to scattered light and reflections, which is further exacerbated by the air gap between the e-paper, and a tape-bonded protective glass. The OPTαGEL®fills this air gap, reduces reflections, prevents the ingress of moisture, and dirt, thus ensuring a high-contrast display of the e-paper contents. In addition to protective glass, Apollo displays also bonds foils that evenly distribute the light of the front lighting. Not only is our OPTαGEL® long lasting, but e-paper bonding process is reversible, too. The shock resistance was proven by drop-ball tests. The video shows drop ball tests with a smart phone: The first one with an Opto-gel protective film, the second one without protective film. By eliminating the isolating air gap between the panes of glass, heat can dissipate through the front glass. Together with our customers a wide variety of certifications in agricultural machinery, automation, automotive, avionics, MIL, ourdoor and railway were carried out successfully. We are offering VacuBond® as a production service for any available display, no matter if it is part of our standard product range or not. We produce samples in any size up to 32″ within a few days. In order to be even faster and more precise, we create the tools for sample productions on our own 3D printer. The Data Display Group has two identical VacuBond production facilities at its headquarters in Germering near Munich and at its site in Ronkonkoma, NY / USA. This ensures a permanent supply and a comprehensive risk Management.